NAMM 2019: The EVH Wolfgang is a modern classic and the Standard model represents an affordable step onto the Wolfgang ladder. With the introduction of new EVH Wolfgang WG Standard Xotic options, there’s now even greater choice. 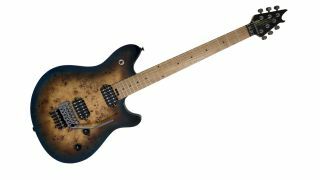 The Wolfgang WG Standard Xotic features a basswood body with a ‘comfort cut’ forearm and poplar burl top, wrapped in tasty Midnight Sunset finish. Alternatively, the Wolfgang WG Standard Xotic Ziricote edition features a Ziricote top over the basswood body. This model is available in a Natural finish. Both models cut a dash with masked-off natural body binding, one-piece bolt-on baked maple neck, complete with graphite reinforcement rods, hand-rubbed oil back finish and a smooth baked maple fingerboard with 12”-16” compound radius. In the pickup department, both guitars come fully loaded with dual EVH Wolfgang humbucking pickups mounted directly to the body for increased resonance transfer. The EVH-branded Floyd Rose Special bridge and R2 locking nut should keep the instrument in tune, however hard you push your whammy bar. Two dome control knobs have been dialled-in to Van Halen’s specifications, enabling guitarists to dial in their sound, without tarnishing the crisp high-end of the Wolfgang pickups. Both guitars come in at a pocket-friendly £495. But that’s not all. There are some cracking new finishes available for the Wolfgang WG Standard QM and Wolfgang Special models, too. The Standard QM is now available in lush Mango Burst or Tri Fade finishes, complete with a black headstock and black chrome hardware. You can also now pick up the Wolfgang Special in a smooth Primer Gray finish with matching headstock, black body binding and an ebony fingerboard, or in Metallic Blue or Polar White with a matching headstock and maple fingerboard. The Metallic Blue model also now features single-ply cream body binding, while the Polar White guitar features single-ply black body binding. Standard models will set you back £495, while the Specials come in at £1,009. For more on the new guitars, head over to EVH Gear.